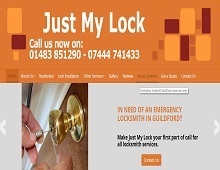 Just My Lock are an experienced locksmith in Guildford, for many years they have been providing a wide range of locksmith services in Godalming, Guildford and throughout Surrey. Whether you have jammed your locks, lost your keys or simply need new locks in Guildford for your residential or commercial property, Just My Lock can help! Using non-destructive entry techniques, the friendly and professional team at Just My Lock can gain entry to your property in an emergency. They can also provide surveys and offer great advice on the best safety solutions for your home. If you are looking for a very experienced locksmith in Guildford to install new locks, repair old locks or help you gain entry to your property with a 24/7 emergency locksmith, then contact Just My Lock for more information on their locksmith services.